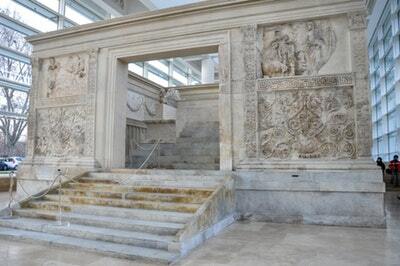 The Ara Pacis Augustae, (the "Altar of Augustan Peace") is commonly called the Ara Pacis. It was dedicated to Pax, the Roman goddess of peace in honor of the peaceful conditions that the Emperor Augustus (r. 27 B.C.–A.D. 14) was able to bring to the Roman Empire. The monument was commissioned by the Roman Senate on July 4, 13 BC to honor the return Augustus to Rome after one of his campaigns and dedicated on January 30, 9 BC. It was located in the Campus Martius, a large, formerly swampy, parade ground on the east side of the Tiber River—about 1 mi. northwest of the center of the Roman Forum. Because of the flooding of the Tiber, it was buried in 12 ft. of debris and gradually fragments of it have been recovered. It was reassembled in 1938.